The first thing you discover about Karl Wienhold is that he can talk. Fast. And it’s all about coffee. He’s the co-founder of Direct Origin Trading, which he describes as a “direct trade collective”. In other words, it’s a network of small-scale specialty producers and international roasters, all based in Colombia, delivering micro lots to consumers worldwide. What I wanted to know was why he believes this is better than direct trade or any of the other existing models. Discussing cultivation and farm management with the mayordomo (farm manager) Don José. A U.S.-born economist transplanted to Colombia, Wienhold met Frank Villada in 2013. Villada is a Colombian native from the Eje Cafetero region and an established roaster, cupper and former coffee farmer. He’d been supporting small farmers in his home for years, evaluating their farm processes and offering advice on improving quality to help farmers make more money. However, he ran into the same problems again and again – no matter how good the cup, farmers continued to struggle to access markets. And so Wienhold and Villada became partners. Their idea was simple: connect local farmers to international roasters. Yet it soon became clear that this wasn’t enough. 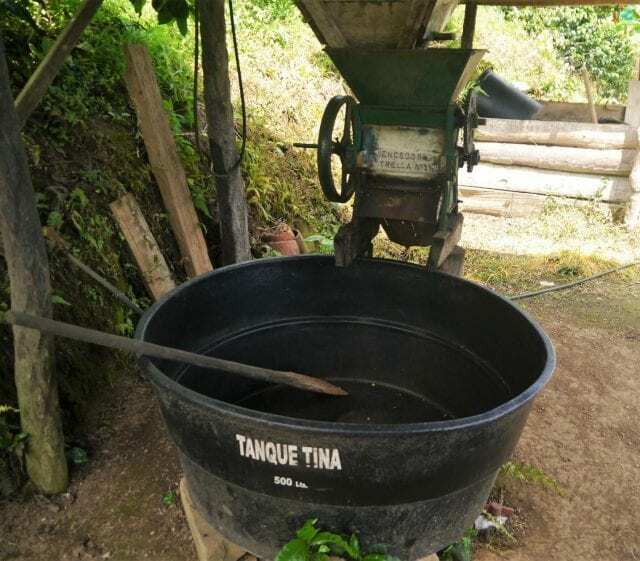 Farmers needed training on quality and help with international marketing, while roasters wanted direct, transparent access to one-of-a-kind, single-farm micro lots. They needed to consider a different kind of model. Wienhold discusses drying techniques with Joaquín Londoño on the elba (drying patio) on the roof of Londoño’s house. 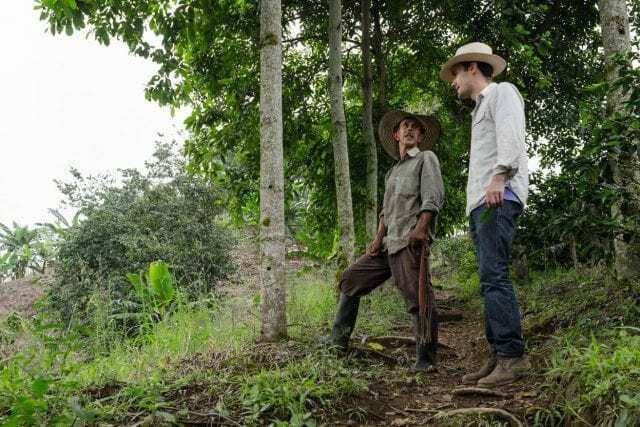 A simpler model, however, can enable producers to see more of the profits, and Wienhold stated that it also, crucially, allows the coffee to be associated with the farmer rather than just the importer. Roasters can then be connected to specific farmers with crops they like. They partner together to continuously improve quality and highlight flavors and aromas the roaster prefers. 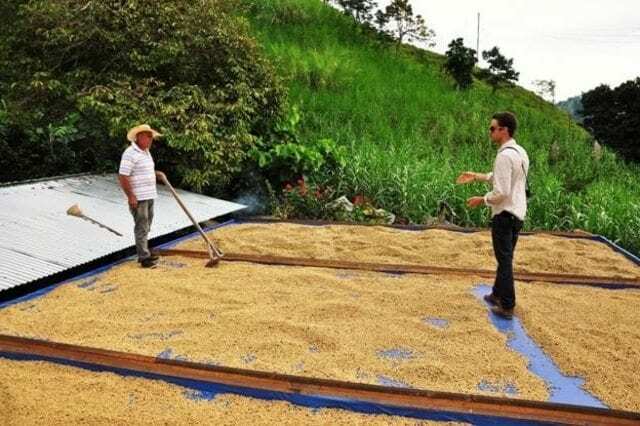 And since the farmer has the security of a reliable buyer and a fixed price, they can invest in infrastructure for coffee quality improvement. My next question was: what makes a network like this stand out when compared with direct trade? A coffee picker gathers the last cherries of the evening in Sevilla, Valle del Cauca. I asked why it’s so difficult for farmers and cooperatives to access markets themselves. And, even though this question was posed over the phone, I could almost see Wienhold rolling up his sleeves to talk about his second favorite topic: economics. 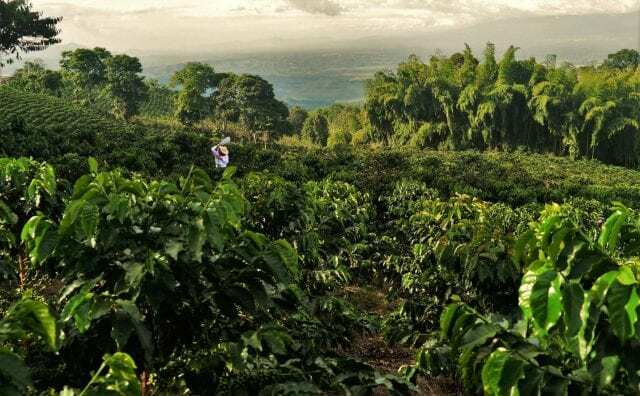 He explains that the modern coffee industry is propped up by what’s called the New York C-Price – a coffee price based on the global demand for coffee and investor speculation on future coffee prices. Wienhold, Villada, and other buyers of specialty coffee, however, pay farmers a fixed price based on what roasters are willing to pay for the coffee – not on the fluctuating price determined by the international market for all Arabicabeans. 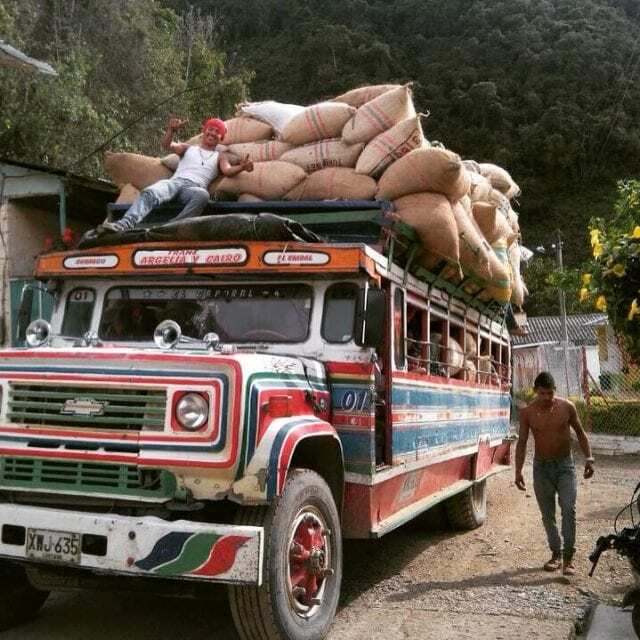 Chiva (buses) are the principal form of parchment coffee transport in rural areas, like this one near El Águila, Valle del Cauca. This means putting a page about the farm on the company website, arranging sampling with international roasters, and promoting the coffee at industry events – all things that producers, especially producers of micro lots, might struggle to do alone. 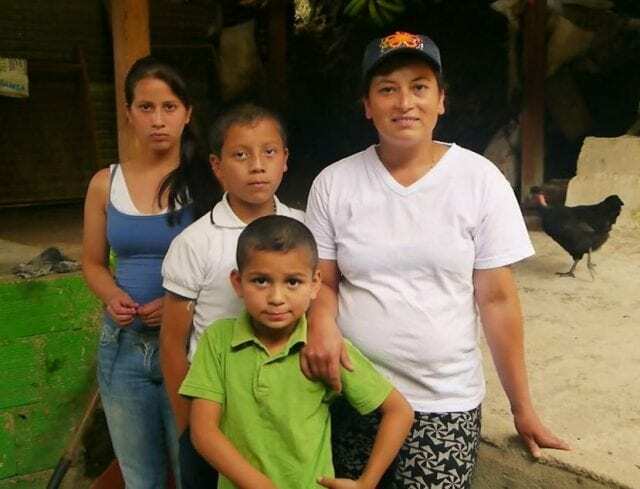 Luz Mila Gonzalez and her three children live together on her farm, Finca El Oasis, in Gaitania, Tolima. Direct Origin Trading has connected 25 farmers with roasters who buy their coffee. However, as Wienhold explained, the right price isn’t always the highest price. Instead, it’s what roasters are objectively and consistently willing to pay. Wienhold and his team work directly with 85 farmers to help them improve farming techniques and produce a better crop. For their commitment to preserving cup quality, farmers receive cupping feedback and unlimited technical assistance from experts, so they can continually improve the cup they produce – and up the price they receive for it. For Wienhold and Villada, the best way to increase prices is not through driving a hard bargain for the roaster. Instead, it’s through improving cup quality, simplifying the supply chain, and having an advocate for the farmer – all things which are made possible by a network of coffee farmers and roasters. The wet mill that processes all of the coffee from Finca La Cabaña. The coffee industry is complex, full of concepts such as price elasticity, hedging, and efficient markets. But it can be simple. In the end, after all, it’s about people. And land. And that intimate act of growing something nourishing and delicious and then sending it out into the world to be bought and enjoyed. The beauty of a simpler trading model is that it can foster the conditions for this to happen – and also has the potential to ensure farmers receive the right price for the right coffee and bridges between farmers, roasters, and consumers and built. I’ve flown back home to Nairobi now. And as I sit here in a crowded café, with my own cup of Kenyan coffee, I breathe deep and wish I could tell the farmers how much I’m enjoying it. It isn’t single origin, but I take a moment and imagine a small farm and a proud farmer. I can almost taste the sunlight. Written by A. Scoville-Weaver, with thanks to Karl Wienhold of Direct Origin Trading.